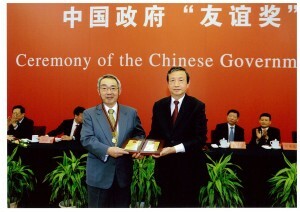 Shin-ichi Kurokawa, professor emeritus at KEK, vice president of Cosylab and former chair of the ILC Steering Committee, was awarded the Friendship Award of China, the highest honour that the Chinese government confers to foreign experts for their contribution and dedication to China’s economic construction and social development. On 28 September, the awards ceremony for the 2012 Friendship Award of China was held at the Great Hall of the People, Beijing. Fifty experts from 22 countries, including four from Japan, received the award this year alone. On 29 September, the Prime Minister of China, Wen Jiabao, met the awardees, who were then invited to the state banquet to celebrate the 63th anniversary of the creation of the People’s Republic of China. Launched in 1991, the Friendship Award of China expresses China’s gratitude to awardees and rewards their outstanding achievements and dedication to China’s development and construction in the fields of economy, technology, education and culture as well as fostering talents. Up to this year, a total of 1249 experts from 65 countries have won the Friendship Award of China. Kurokawa has been fostering a cooperative relationship in accelerator science between China and Japan for a long time. Last January, he was given the award for International Scientific Cooperation by the Chinese Academy of Sciences (CAS), which honours eminent foreign experts who make outstanding contributions to facilitating cooperation with the CAS in science and technology. Kurokawa has visited China 60 times. Since the 1980s, he has been actively promoting academic cooperation and exchanges in science and technology, collaborating with Chinese researchers at the Institute of High Energy Physics (IHEP), the Shanghai Institute of Applied Physics, the University of Science and Technology of China, and the Institute of Modern Physics. In 1999, Kurokawa organised the first major Asian accelerator school held in China and carried it to a successful conclusion. In 2000, he initiated a collaborative programme between the Japan Society for the Promotion of Science and CAS. This programme was continued for a decade, involving many institutions and universities in China and Japan. Later, Korea and India also participated in the project, making it a truly Asian-wide collaborative programme. He also helped IHEP to upgrade the Beijing Electron Positron Collider (BEPC) to BEPC II, transferring the superconducting accelerating technology used at the KEKB accelerator to China. He also served as a member of the Machine Advisory Committee for BEPC II and provided many valuable comments and suggestions. Kurokawa served as chair of the Asian Committee for Future Accelerators (ACFA) from 2004 to 2006, and chair of the ILC Steering Committee from 2005 to 2007.